Blu-ray, DVD Release: Keep Your Right Up! Come fly away with Jean-Luc Godard in Keep Your Right Up! The 1987 comedy-drama fantasy film Keep Your Right Up! is written, directed by, and starring the legendary Jean-Luc Godard (Histoire(s) du cinema, Weekend) – with a tip of the hat to Jerry Lewis, Buster Keaton, Jacques Tati, and even Dostoyevsky. 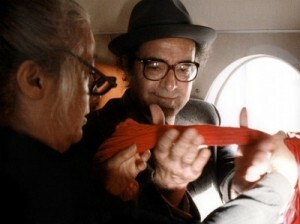 The movie’s rambling plot involves a hapless filmmaker (Godard) and his attempt to meet a deadline for delivering a film. From there the movie branches out into an abstract, episodic structure wherein a group of actors play several real or fictional roles. The film is divided into three sections which inter-cross throughout and in each, a group of people search for their proper place on earth. Godard describes his experimental and undeniably confusing unrated film as “the camera versus landscapes over 17 rounds”. Presented in French with English subtitles, the DVD and Blu-ray releases of Keep Your Right Up represent the film’s first ever legitimate release on disc in the U.S.
Buy or Rent Keep Your Right Up!